What Should I Bring to Do These Hikes on Oahu? Bug repellent is highly recommended for hikes on Oahu. Sometimes I get lazy and don’t use bug repellent and I end up with bites on my arms and legs that don’t go away for a month. This is especially relevant for waterfall hikes, because the mosquitos are drawn to the little patches of still water. There are both traditional and natural options to help you ward off the little critters. Your shoes will never fully recover from the dust, dirt, and mud on some of these hikes. Sometimes they simply will not make it out. (I once was on an Oahu waterfall hike and the literal soles of both of my shoes came off in the mud!) However, intense, professional hiking boots are not at all necessary. Recently, I’ve been putting my Fila Women’s Day Hiker Shoes to good use, and they’ve held up quite well. And there’s also a men’s version. Most people forget to bring a plastic bag along with them on hikes to put their muddy or dusty athletic shoes in after hiking. If you’re trying to be more eco-friendly, try this reusable plastic bag and give it a good wash when you get back to where you’re staying. A.K.A. slippers in the local lingo. You’ll need something to wear after you shove your muddy or dusty athletic shoes into that plastic bag. It’s a necessity for hiking. Perhaps in a nice reusable bottle to help the environment out. Maybe something from either Part 1 or Part 2 of the Hawaii food bucket list. You want to capture all of your adventures, don’t you? I’ve been looking to purchase the Nikon D3500 to do the job. This section isn’t to scare you. It’s just to make sure that you’re prepared! On most of the Oahu hikes listed below, the trails are pretty clear. However, there are a couple with slightly confusing paths, which is not ideal. So keep your eyes out for brightly colored (usually orange, pink, or blue) flags tied around tree branches to guide you. If the trail has recently changed (which happens on occasion), the trail markers may instead be carved into trees or marked with little splashes of spray paint. If you’re planning on doing one of Oahu’s waterfall hikes, you should be aware of a bacteria called leptospirosis that is present in the water. Leptospirosis can only be harmful if it enters the body through an open cut (so if it’s scabbed over, you’re fine) or by drinking it. While some cases of leptospirosis may have bad flu-like symptoms, others have no symptoms at all. Personally, I have not heard of anyone actually getting leptospirosis on these hikes. Once I even got a small cut from a rock in a waterfall pool and did not have any signs of leptospirosis. If you would like to read a bit more on the bacteria, here’s a page from the CDC. I decided to rank these hikes on Oahu based on three different categories: effort, reward, and number of people. These categories will be ranked on scale of 1 to 5, with 5 being the most. So for me, ideally, the numbers would be 1 for effort, 5 for reward, and 1 for number of people. 1: I took a three-year-old on this hike, and he did it without being carried. 2: Ok, this is a little bit difficult, but it’s still fun. 3: This is quite difficult, but definitely still doable with several breaks. 4: Why the heck did I subject myself to this? Should I turn around? No, I’m too stubborn for that. 5: The only reason I’m doing this is because it’s at the top of my bucket list. This is the hardest thing I’ve done in my life. 1: It’s not on this list, because something with a level 1 reward is not worth it. 2: It’s also not on this list, because something with a level 2 reward is not worth it either. 3: I mean, it’s good. But I also feel like I’ve seen better for significantly less effort. 4: This is awesome. That effort was totally worth it. 5: This is probably in the top 10 views I’ve ever seen in my life. And well, the number of people scale is just relative to the hike with the most people I’ve ever seen (a.k.a. Diamond Head, which was much too crowded and did not make it onto this list). Ok, I’m All Set! Tell Me About These Awesome Hikes on Oahu! Lanikai Pillbox is one of my favorite hikes on the island. It’s easy, and you get an amazing view of the Mokulua Islands and the Pacific Ocean as a reward. You can make it to the first World War II military pillbox in 25 minutes! (And honestly you don’t need to go any further.) The one downside to this hike is the number of people that come on it. 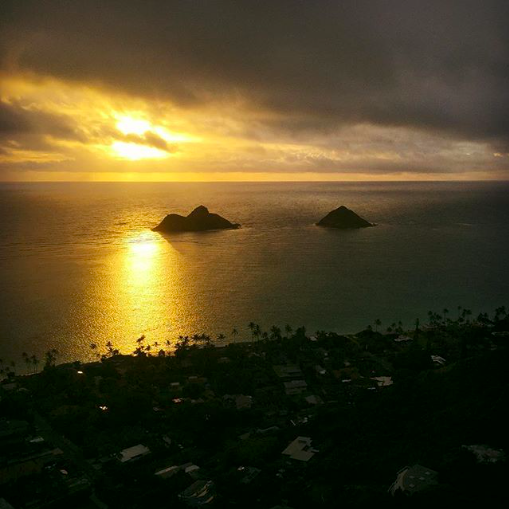 The combination of fame, views, and ease cause Lanikai Pillbox to be rather crowded – even at sunrise. 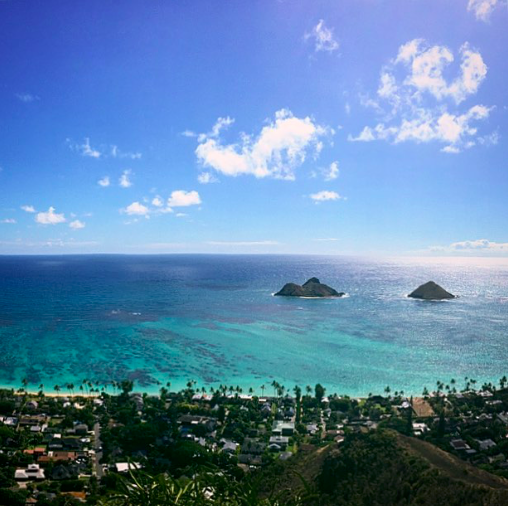 There is only street parking available for the Lanikai Pillbox hike. Watch out for no parking zones, and please do not block the residents’ driveways! Interested in this hike? I have a whole post about it! Koko Head Crater Trail is another one of the well-known Oahu hikes. That said, I think it’s overrated. It’s not a bad hike, it’s just an overhyped one. If you’ve got a limited amount of time on Oahu, I don’t think Koko Head’s effort-to-reward ratio is worth it. It’s a lot of effort on a mile-long, very steep, rickety old 1,000-step train track for an okay view. And then you get to the top and there are a ton of other exhausted humans up there with you. While some people can do this hike in 20 minutes, it takes me around an hour. I will say that you can see a decent chunk of the island from the top of Koko Head Crater Trail. It’s just not the most visually stunning parts of the island in my opinion. Maybe it’s more awe-striking for sunrise – or you can try one of these other sunrise hikes instead. There is a designated parking lot for the Koko Head Crater Trail. 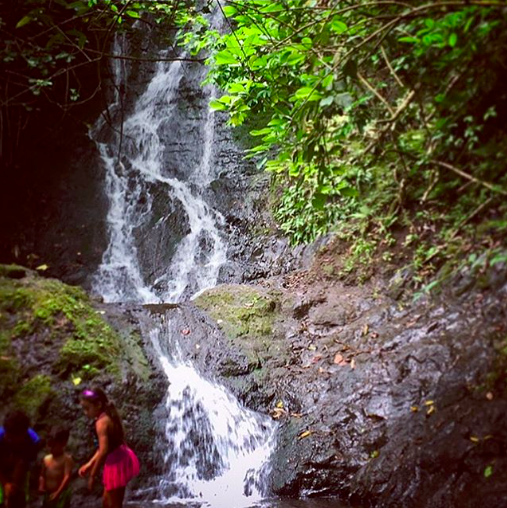 Lulumahu Falls is one of the easiest and most rewarding waterfall hikes on Oahu. For about 45 minutes of hiking with a couple of easy river crossings, you can see a thirty-foot waterfall! That’s pretty amazing to me. Just as a note, the pool at Lulumahu Falls is not quite deep enough to swim in. If you happened to complete the hike to Lulumahu Falls in the past (2017 or earlier), the path has changed since then. Because it is on the Hawaii Board of Water Supply property, they have implemented some measures to deter hikers (a.k.a a few metal fences). Some hikers have simply chosen to hop the fences, but there is an alternative path that does not require fence-hopping. Instead of immediately turning left according to the old path, continue to go straight for a bit. Once the path naturally veers to the right, keep your eye out for a path on the left. Take that path and you’ll be on your way to Lulumahu Falls! There is a muddy parking area for Lulumahu Falls just off the side of Pali Highway. Want to do a waterfall hike, but this one doesn’t quite fit your style? Here’s a post with seven more. Right next to the famed Makapuu Lighthouse Trail is the Tom Tom Trail. As a matter of fact, you use the same parking lot! The entire Tom Tom Trail is six miles long, but most people stop within the first couple of miles of the hike anyways (that’s where the awesome views are). This also means that the time necessary to complete the hike varies a lot – from only an hour to 4.5 hours. Just a heads up, the first small chunk of the hike is rather difficult, but don’t let that stop you! It will get easier as you go on! Chinaman’s Hat has also made it onto this list of fantastic hikes on Oahu, because this hike is so unique. In order to even get to the start of the hike, you have to do a 30 to 45-minute kayak or paddle board trip over to the island. You get your blood pumping before you even get to the start of the hike! The short 20-minute hike on Chinaman’s Hat is grueling. If you thought your blood was pumping from kayaking or paddle boarding, trekking your way through the thin dirt paths and miniature rock-climbing sections will make you forget about the paddling you did to get to the island. Depending on where you choose to start your paddle, parking will either be on the side of the road or in the parking lot of Kualoa Regional Park. For more information on this hike, my Adventures of Chinaman’s Hat post has it all! Interested in other kayaking adventures on Oahu? We’ve got six more. 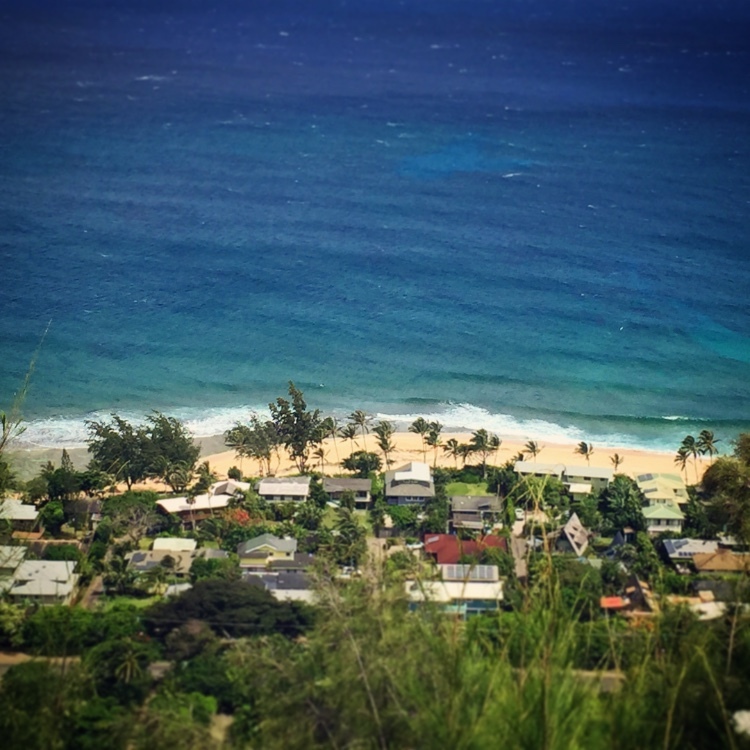 Maili Pillbox is one of the only hiking trails in West Oahu – and it also happens to be one of my favorites. The trail is clear once you find the start (between the 10thand 11thlight poles of Kauakama Road – there’s a clear break in the grass). Other hikers are few and far between. Plus, the pretty awesome view is one that you can’t see from anywhere else on the island. As a matter of fact, it is the ONLY place I can think of where you can get a bird’s eye view of the coastline of West Oahu. 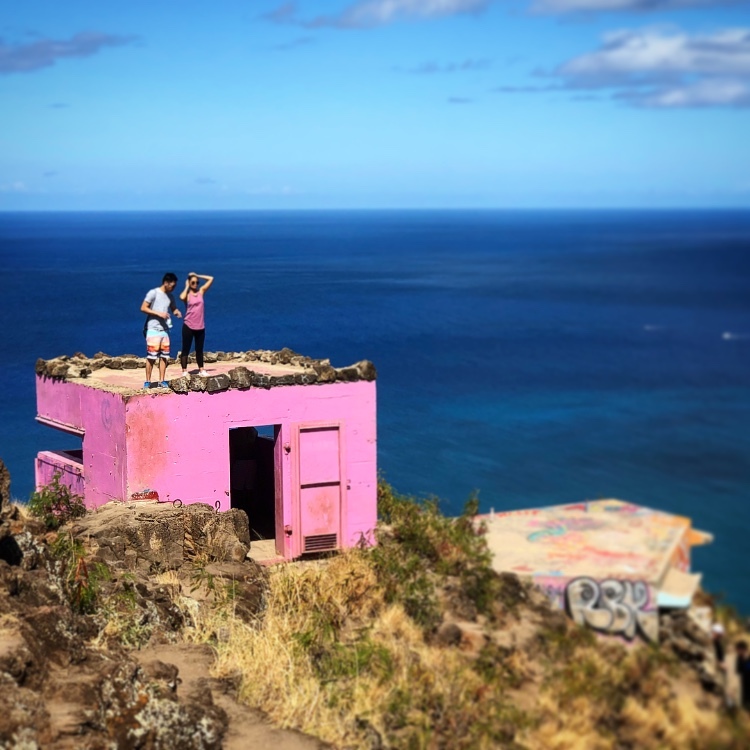 And on top of all that, it has four World War II military pillboxes at the top, one of which is bright pink and filled with memories of breast cancer survivors. This hike is about one mile one way (two miles round trip), and it takes about an hour and a half at a leisurely pace. Parking for Maili Pillbox is just on the side of the Kaukama road near the start of the hike. *Note: the west side of Oahu is very hot. Bring some extra water with you. Looking for North Shore hikes on Oahu? Ehukai Pillbox is a fantastic option for you. This hour-long hike is not too difficult, and it’s the only hike that gives you a bird’s eye view of the giant waves at Banzai Pipeline. One note to make is that Ehukai Pillbox surprisingly muddy for a non-waterfall hike, which means there are also mosquitos in the area. There are a few parking stalls near the start of the Ehukai Pillbox Trail. If you’re interested in this North Shore hike on Oahu, get more information in this post. Puu Maelieli Trail is the last of the pillbox hikes on this list of Oahu hikes. Located in Kaneohe, this hike is just off of Kahekili Highway. To find the start of the hike, walk away from the Temple Valley Shopping Center on the right side of Kahekili Highway. There should be a bright yellow-tipped pole to signal the start of the trail. 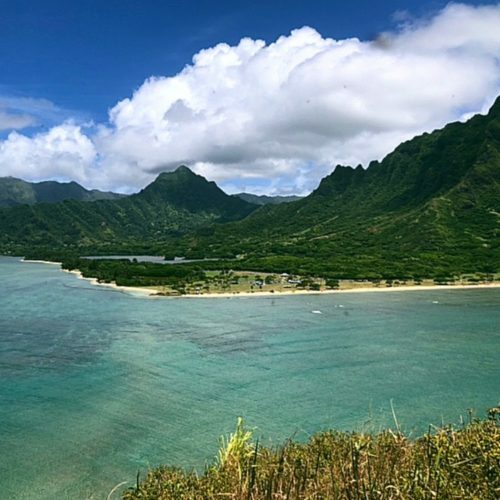 This 1.5-mile hike ends with a stunning view of Kaneohe Bay from the SECOND pillbox. To be honest, the first pillbox does have that much of a view. Parking is available in the Temple Valley Shopping Center or on the side of Kahekili Highway. Kaena Point is slightly better than average on all aspects of judging. Despite that fact, it has still made it onto this list for a couple of reasons. First of all, you can’t get to Kaena Point withouthiking. This is actually the only portion of the coast of Oahu that doesn’t have a road. Second, Kaena Point can be done from both the west side of Oahu (Waianae) and the North Shore (Waialua) – and both of those sections of Oahu don’t have a ton of hikes. So if you’re hanging out in Ko Olina or Haleiwa and want to do a hike, Kaena Point is the hike for you. Hiking Kaena Point from Waianae is a pretty flat trail. However, it is also 5.6 miles with very little shade. From the North Shore, the hike is about 3.5 miles – also with minimal shade. The North Shore path is quite a bit rockier than the Waianae path. 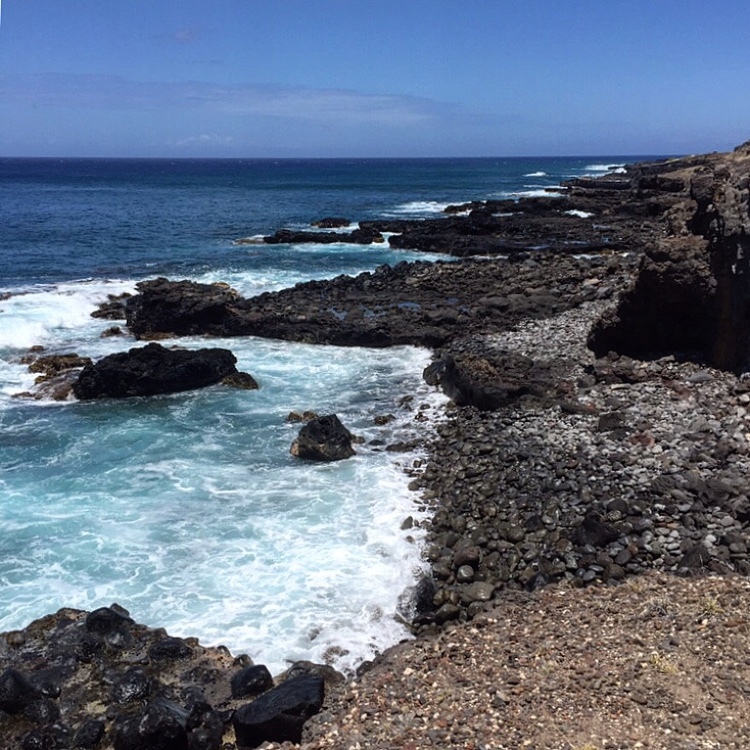 Either way that you choose to tackle Kaena Point, you’ll end up at, well, Kaena Point. The point itself is actually a bird sanctuary. It’s pretty common to see monk seals chilling on the rocks in the sun right next to the crashing waves. Please be sure to give the monk seals their space. You wouldn’t like people getting all up in your face to take pictures when you’re sleeping, so the monk seals don’t like it either. There are little unofficial parkingl lots at the start of each end of the Kaena Point hike. 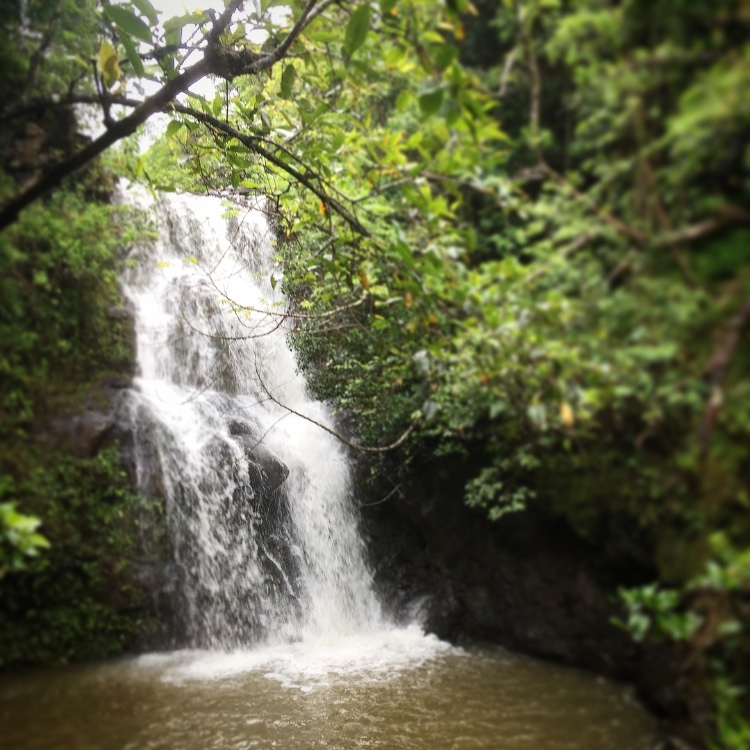 Looking for one of the easiest waterfall hikes on Oahu? Likeke Falls is the hike for you! It’s so easy that on quite a few of my times hiking this trail, I’ve seen mommy and me groups also doing it! There are a couple of unexpected turns on this hike, so, if you’re thinking about doing it, refer to this more detailed most on Likeke Falls! The unofficial parking for Likeke Falls is located at the back of the parking lot for Koolau Ballrooms. Recently, Instagram has been responsible for the increasing number of people attempting the Crouching Lion Hike on Oahu. This 1.5-mile and 45-minute hike is rather steep at times, but it ends in an amazing view of Kahana Bay and the Koolau Mountain range. As for parking, do NOT park along Trout Farm Road, as your car could get towed. Instead, park at Swanzy Beach Park. *Pro Tip: Do not hike on or after a rain day. That’ll just make the journey much more difficult than it needs to be. 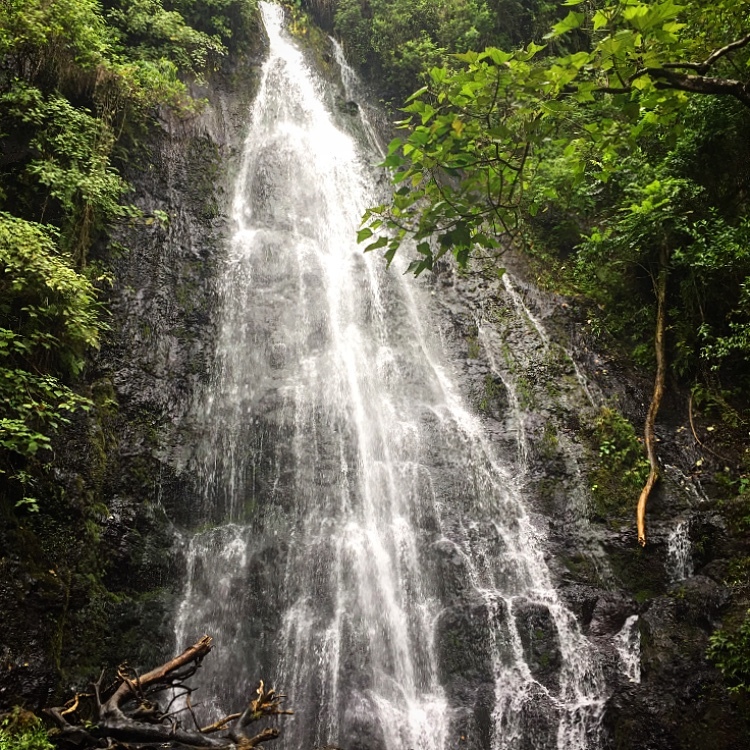 Hamama Falls is one of the hikes on Oahu that’s actually pretty close to Honolulu. 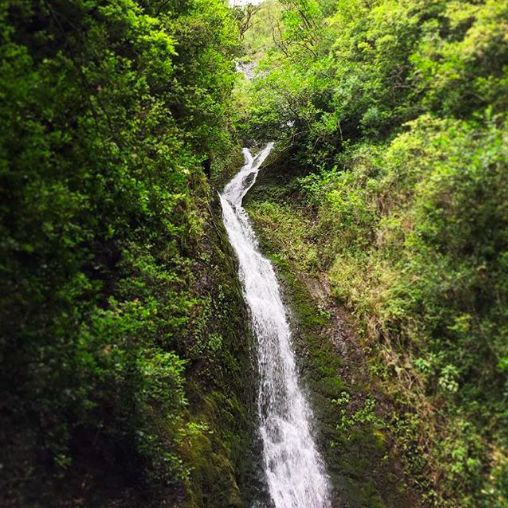 Just to the east in an area called Hawaii Kai, Hamama Falls is a fun hike to try. It’s enough effort to get your blood pumping but not too much. One of the best perks of Hamama Falls is the fact that no really one knows about it, yet the trail is extra clear. So you’ll get the falls all to yourself, and you won’t get lost! Only street parking is available for Hamama Falls. Please be respectful of the residents and make sure that you do not block their driveways! This 0.8-mile hike is one of the most dangerous hikes on Oahu, especially for people that are not experienced hikers and/or rock climbers. So please if you are not confident in your hiking abilities, think again about attempting this hike! Throughout the Pali Notches, you’ll be following a thin path at the top of a mountain ridge line. If the island trade winds are blowing that day, that’ll make the hike even more difficult. On some of the more difficult climbing parts of the hike, there are ropes to help you on your way. But be sure to give the ropes a good tug to make sure it can hold your weight! The start of the hike and the parking are actually at the Pali Lookout, a popular tourist spot! I’m not going to lie to you. Despite the fact that the beginning of this Oahu hike is rather flat, the journey to Waimano Falls is pretty difficult, especially if it’s rained recently. I mean, there’s even a large section of the hike called “heart attack hill”! But the reward is awesome. First of all, there is a stunning waterfall that’s about 25 feet tall. Second, there’s a pool deep enough to jump or swing into. I can’t think of another waterfall hike on Oahu with a consistent swinging rope. So if you want to feel like Tarzan, this is the hike to go on. That said, there is one very crucial turn to take to get to Waimano Falls. If you don’t take it, you’ll get very lost. There will be a point in the trail with a clear fork in the road (not the one that says, “Manana Falls to the left, and Waimano Falls to the right.” It’s quite a bit after that.). Both paths will seem well-trodden. You MUST go to the left, not the right. If you find yourself in a little clearing, you’ve wandered off of the path and you should backtrack. Only street parking is available for Waimano Falls. Please be considerate of the residents in the area. Undoubtedly the most famous Hawaii hike is the Stairway to Heaven, also known as Haiku Stairs. This 4,000-step hike up the Koolau Mountain Range and into the clouds is one of the most popular Oahu bucket list items. However, it is also the most illegal. With a guard posted in front of the entrance and the threat of a hefty $1,500 fine, the Stairway to Heaven has only become slightly less popular. For more information on how to navigate the steps, guard, and fine, this guide should help you out. Feeling hungry after one of these amazing hikes on Oahu? Check out this list of the best Oahu restaurants. While I try my best to update this list whenever I become aware of a change, please check to see if these trails are still legally open before you do them. The statuses of trails in Oahu do change, so any of these trails could become illegal, either temporarily or permanently, at any time. Are you a hiker? Do you want to become one? Are you planning a trip to Hawaii? Do you want to plan one? If you answered yes to any of those questions, you should pin this post for later! Disclosure: I use referral links in this post, and I might make a commission on my recommendations. Anyway, I LOVE the look all of those waterfalls, and i really love your way of rating the hikes. I think my ideal hike would be 4-5-1. I don’t mind putting in the effort for an amazing view pay off without too many people!! Yeah, they’re all pretty much illegal, because they cross onto private property. But even if the owners are cool with it, it’s still technically illegal, and I thought I should specify that in my post. But you are right. More and more hikes are becoming “illegal” – Crouching Lion used to be a legal hike, and now it’s not. And thank you so much for your comments on the ranking system! That’s how I’ve ranked them in my head for so long, but I wasn’t sure if anyone else would understand it lol. Yes, there are so many hikes on Oahu that are worth doing! Such a useful post! I went to Maui and Kauai two years ago and those islands have so many great hiking opportunities but I love how you’ve put all these different options for Oahu in one post! Also – great tips at the beginning. I went totally underprepared with my Nike shoes and after rainfall they were useless. I should have brought my hiking boots! Lesson learned. So glad you thought this post was helpful!! So much info here, Oahu definitely looks like the ideal place for a hiker – the views are insane from all of them. Didn’t realise how difficult it is to get to the staircase to heaven now. Saving this for our visit. Oahu is definitely a great place for hiking! I hope you get to make use of these tips on your next visit! There are some pretty great hikes on this list – but it’s really too bad that so many of them are illegal. I don’t think my conscience could handle doing those at all, especially if they go through private property. I get that. Maybe try out the legal ones :). Wow lots of great options. I love your ranking system. Seems like a lot of these hikes are illegal? So you are not supposed to do them? Do they fine you if they catch you? You’re legally not supposed to do most of them, because they are on private property. The only two that give out fines are the Tom Tom Trail hike and the Stairway to Heaven hike – and that’s because they are illegal for safety reasons, rather than private property reasons (many inexperienced hikers get overconfident and try to do these hikes, so the fines are meant to ward them off). Thanks so much! I’m glad you enjoyed the post! Wow, this is such a great guide. Stairway to Heaven has been on my list and mind for a while and it’s sad to see it’s illegal! However, I can understand why, as it can be quite a challenging and dangerous hike. I thoroughly loved hiking the Koko Head Trail with the views of Hanauma Bay below. It was a great workout as well 🙂 Saving your suggestions for my next O’ahu visit! Glad you enjoyed the read! Just wow for those views and another wow for the amazing waterfall shots. Oahu looks like an incredible place to hike. I would deffo leave the more dangerous hike to the more experienced hikers though, even if the views are incredible haha. Haha that’s a smart move! After visiting Maui last year I’ve been looking for another Hawaiian island to go to. It looks like Oahu is full of natural beauty….this just might be next! Honestly, all of the Hawaiian Islands are so stunning. I’ve only ever done the Lanikai pillbox trail and didn’t even make it to the top. I’m such a lousy hiker! It did start raining and a lot of us ended up skiing downhill in the red mud. Funny and scary at the same time, but the camaraderie was sweet. We all helped each other down even if we just met as we skidded by. I can’t wait to give it another shot! I’ll be trying all the legal spots only, though. oh my gosh oh no!! I’ve never done Lanikai Pillbox when it was raining! And even when it’s dry, I decide to sit down and slide on the way back down LOL. I can’t imagine how difficult that was! Of course! So glad you enjoyed the tips! such a fantastic and super informative post! 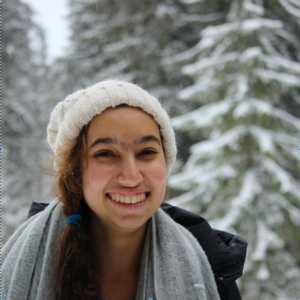 I loved your packing list and your advices for leptospirosis, it’s something just few bloggers seem to take into account! Great photos too, especially the cover one! Thank you so much! I’m glad you enjoyed the post! That looks so fun! Now I want to go hiking on Oahu! As an avid hiker, this post is so useful. 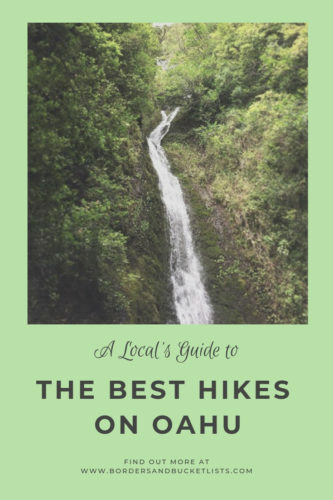 I had never consider Oahu as a hiking destination, but then again Hawaii has so many wonderful hidden finds and you gave such a comprehensive list on this! Thanks a ton Sarah! You’re so so welcome! 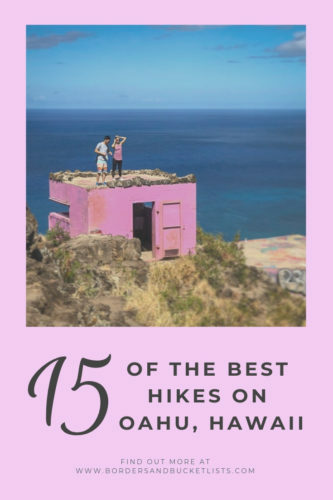 Oahu has a TON of hikes, so if you’re looking for a hiking destination, this is definitely a place you should keep in mind! Wow, so many illegal ones! I don’t think I could ever do Stairway to Heaven, but I know people who have. I’m really gutted I didn’t do Koko Head, so I’m kinda glad you’ve said it’s not really worth it, haha. Great post! Girl, same! The 4,000 steps of the Stairway to Heaven seem so rough!